Citra, as Scythe Anastasia, strives for morality with her compassionate gleanings that allow those chosen a month to prepare. This is her way to find peace and pride in her gleanings. Meanwhile, Rowan, as Scythe Lucifer, is a merciless vigilante who gleans corrupt scythes straying from a mission in which he still believes. Ending life is the only path left to him. Pulling the strings in the background, the omniscient artificial intelligence, the Thunderhead, seems to be amending its off-limits approach to scythes. As the delicately balanced system begins to crumble, the Thunderhead compels humans to intervene. The intricately plotted story with twists, turns, and foreshadowing races to a jaw-dropping cliffhanger that will have teens eagerly awaiting the third installment. Citra and Rowan mature into complex, believable characters with equal parts strength and vulnerability. Through reflective diary entries, the Thunderhead’s growing sentience raises thought-provoking questions about power, morality, and sacrifice. 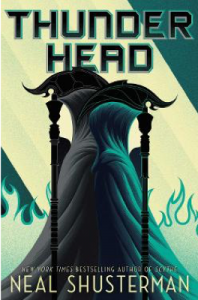 Fans of books about near future and utopian societies gone awry such as Shusterman’s Unwind and Veronica Roth’s Divergent series will enjoy this book. 15-year-old Xiomara Batista is many things- being the daughter of Dominican immigrants, a twin, Catholic, and curvy- but this combination of things that makes up her identity means that she often feels unheard and unseen. Xiomara’s past tendency to speak with her fists hasn’t helped her express herself to the world around her, so when life gets really complicated- her relationship with her parents and her twin brother begins to unravel, a new boy who she must keep secret enters the picture, and she faces a test of faith- she joins her high school’s slam poetry team to use her words to fight back instead. 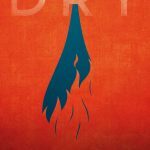 Acevedo’s poetry is lyrical and powerful, and creates in Xiomara a protagonist who is in turn strong and vulnerable, faithful and skeptical, and loyal and rebellious. Acevedo seamlessly weaves together a multitude of themes- Latinx culture, religion, immigration, loyalty, sizeism, sexuality, friendship, familial & romantic love- without overwhelming the text or distracting from Xiomara’s personal journey. 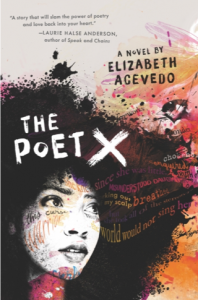 Xiomara’s discovery of her identity is mirrored by the increasing lyricism of her poems, and the use of free verse makes The Poet X an entirely engrossing and empowering read for teenagers. Teens who seek out books about Latinx characters and identity, such as Erika Sanchez’s I Am Not Your Perfect Mexican Daughter and Isabel Quintero’s Gabi, A Girl In Pieces, will find in Xiomara a character to root for and be inspired by. 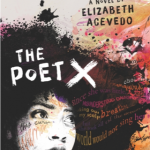 Teens who enjoy books in powerfully written free verse, such as Jason Reynolds’ Long Way Down, will be inspired by Acevedo’s use of poetry as self expression.